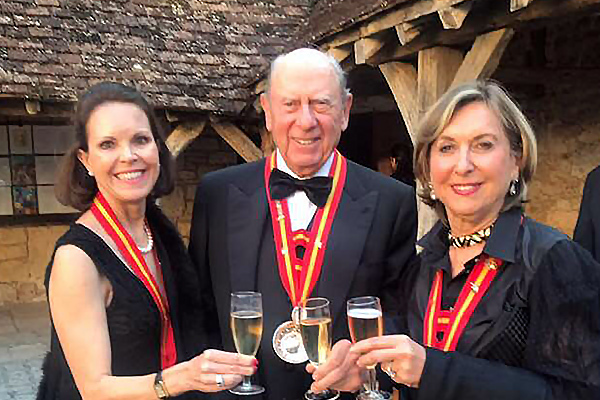 On May 5 this year, one of my lifelong dreams bore fruit when the Chevaliers du Tastevin, a vinaceous fraternity that pledges allegiance to Burgundy wines and the enjoyment of same, inducted me as a member. Started in 1934, though elite wine societies have been around since the 12th century, the order holds a number of Chapitres ‒ large banquets where the brotherhood can invite guests to join their annual bacchanalia, celebrating both seasons and saints. Crested envelopes with the franked confrérie crest from Beaune, Côte D’Or brought news of my induction and seating plans on elegant textured paper. A separate card printed with images of the dress code made it clear that “black tie and long evening dresses (were) obligatory”. The deep guttural moan of French horns ‒ blown by huntsmen in jackets, jodhpurs, and black boots ‒ heralded our arrival to the impressive 12 century Château du Clos de Vougeot in the Cote d’Or region, where the famous Clos de Vougeot Grand Cru is still made from the surrounding 50 hectares of vineyards planted by Cistercian monks. Inside, an Impressionist Utrillo painting hung on a large stone, just one of many awe-inspiring works of art, tapestries, and sculptures. Low heeled shoes are preferable in these cobbled courtyards and I joined the other guests in all their finery, sporting the golden and scarlet ribbons that identify members, their silver tasting cups – tastevin –  glinting in the light. The colours represent Burgundy’s red and white wines, hues accentuated in candle-lit cellars by the tastevin, a shallow saucer-shaped receptacle pressed with iconic designs. We sip locally-made Cremant de Bourgogne and introduce ourselves. Voluble greetings and eager discussions on food and wine are heard before we approach the original centuries-old wooden wine press for the prestigious gathering. French Horn players and court jesters dressed in red, green, and yellow serenade the guests with stirring traditional music as the Grand Conseil of chevaliers in gold-trimmed red academic gowns and flat caps ‒ fashioned after the attire of 16th-century theologians with the tastevin as their symbol ‒ perform the Gallic ceremonies. As the chevaliers introduce me and the Juliet Cullinan Standard Bank Wine Festival in French, I take a second to savour the delicious moment of being the first South African woman to be publicly honoured in this way. Mystical words were spoken in homage to Noah, Bacchus and other vintage saints ‒  “Par Noé, Père de la Vigne, Par Bacchus, Dieu du Vin, Par Saint-Vincent, Patron des Vignerons Nous vous armons Chevalier du Tastevin  et vous remettons le grand Cordon de pourpre et d’or aux couleurs de notre Confrérie” ‒ and finally, the coveted silver tastevin, dangling from a crimson and gold ribbon, was bestowed upon me. I was knighted with an 84-year-old petrified grapevine root from Burgundy, kissed on both cheeks, and invited to sign my name into a large register with a red and gold feathered pen. Experiencing all the pomp and circumstance, I consider it ironic that this elite fellowship was formed during the economic crisis of the early thirties. Struggling to sell even their great vintages of 1929, 1933, and 1934, Camille Rodier and Georges Faiveley invited their friends to Nuits-Saint-Georges rather than travel to Paris, for an unforgettable banquet with a gallant welcome. The first Chapter of the Confrérie des Chevaliers du Tastevin was on November 16 1934. For five years during WW2, the Confrérie des Chevaliers du Tastevin fell silent resurfacing only after the Liberation and buying the Cistercian site Château du Clos du Vougeot with its views over the vineyards as their flagship. The epitome of French appreciation for gastronomy, each chapter pledges “to hold in high regard and promote Burgundian produce, particularly her great wines … and to encourage people from all over the world to visit Burgundy”. Each themed chapter is unique with a commemorative painting printed onto the front of the menu. A procession of waitrons bearing traditional fare on silver platters serve the six-course, silver-service dinner to 500 guests. Dishes and wines are amusingly described as we all sing, laugh, and revel in the array of gourmet dishes and wines interspersed with toasts, and more wine, amid trumpeting and French horns. The traditional songs sung by Les Cadets de Bourgogne, Burgundy folk singers in traditional dress featuring beards, flat black caps, and operatic voices might have been the same men who sang in those early days. Little changes over the years at these feasts, where kinship and dedication to the fraternity takes precedence over ‘chasing the buck’ in our hectic world. “Such is the ethos of the Tastevin” with its motto “Jamais en vain, tour jours en vin” (Never in vain, always in wine). I’m privileged to be part of this brotherhood with its rituals and ceremonial traditions of a bygone era. Promoting wine and gourmet dishes in honour of my tastevin is exactly what I intend to continue doing!